To say that the Internet has changed the media business is so obvious it barely bears writing; the media business, though, is massive in scope, ranging from this site to The Walt Disney Company, with a multitude of formats, categories, and business models in between. And, it turns out that the impact of the Internet — and the outlook for the future — differs considerably depending on what part of the media industry you look at. Dixon’s article is worth reading in full; what is critical to understand, though, is that while control of distribution created the conditions for the creation of the cable bundle, there is an underlying economic logic that is independent of distribution: if customers like more than one thing, then both content creators and customers gain from a bundle. A consistent theme on Stratechery is that perhaps the most important consequence of the Internet, at least from a business perspective, was the reduction of the cost of distribution to effectively zero. The most obvious casualty has been text-based publications, and the reason should be clear: once newspapers and magazines lost their distribution-based monopoly on customer attention the integration of editorial and advertising fell apart. Advertisers could go directly to end users, first via ad networks and increasingly via Google and Facebook exclusively, while end users could avail themselves of any publication on the planet. For Google and Facebook, the new integration is users and advertisers, and the new lock-in is attention; it is editorial that has nowhere else to go. First, and most obviously, until the past few years the Internet did not mean zero cost distribution: streaming video takes considerable bandwidth that most people lacked. And, on the flipside, producing compelling content is difficult and expensive, in stark contrast to text in particular but also music. This meant less competition. Second, advertisers — and brand advertisers, in particular — choose TV not because it is the only option (like newspapers were), but because it delivers a superior return-on-investment. A television commercial is not only more compelling than a print advertisement, but it can reach a massive number of potential customers for a relatively low price and relatively low investment of resources (more on this in a moment). Third, as noted above, the cable bundle, like streaming, has its own economic rationale for not just programmers and cable providers but also customers. This first factor, particularly the lack of sufficient bandwidth, has certainly decreased in importance the last few years; what is interesting about TV, though, is that it is no more a unitary industry than is media: figuring out what will happen next requires unpacking TV into its different components. I was right about escapism being on the verge of collapse, but the mechanism wasn’t so much apps as it was one app: Facebook. The use of mobile devices occupies all of the available time around intent. It is only when we’re doing something specific that we aren’t using our phones, and the empty spaces of our lives are far greater than anyone imagined. Into this void — this massive market, both in terms of numbers and available time — came the perfect product: a means of following, communicating, and interacting with our friends and family. And, while we use a PC with intent, what we humans most want to do with our free time is connect with other humans: as Aristotle long ago observed, “Man is by nature a social animal.” It turned out Facebook was most people’s natural habitat, and by most people I mean those billions using mobile. Snapchat is certainly challenging Facebook in this regard, and one of the most interesting questions to watch in 2017 is if this is the year both companies finally start to steal away not just TV’s attention but also TV’s advertising. Facebook is laying the groundwork to do just that; the company has been pushing video for a long time now, and recently added a dedicated video tab to its app. What has been missing, though, is an advertising unit that can actually compete with TV for brand advertising dollars; Facebook’s current advertising options are, both in terms of format but also in their focus on fine-toothed targeting, predominantly designed for direct marketing. Direct marketing has always been well-suited for digital advertising; the point of the ad is to drive conversion, and digital is very good, not only at measuring if said conversion occurred, but also at targeting customers most likely to convert in the first place. Brand advertising is different; whereas direct marketing is focused at the bottom of the marketing funnel, brand advertising is about making end users aware of your product in the first place, or just building affinity for your brand as an investment in some future payoff. The mistake Facebook made for a long time was in trying to win brand marketing dollars by delivering direct marketing results: the company invested tons of time and money in trying to detect and track the connection between a brand-focused advertisement and eventual purchase, which is not only technically difficult — what if the purchase takes place months in the future, or offline? — but also completely misunderstood what mattered to brand advertisers. I noted above that brand advertisers find TV to deliver a superior return-on-investment; with its focus on tracking Facebook was too concerned with the “return” at the expense of the “investment”. Specifically, taking advantage of Facebook’s targeting and tracking capabilities requires the continual time and attention of marketers; it was far more efficient to simply create a television commercial that reached a bunch of people at once and then track lift after the fact. This is why Procter & Gamble, the biggest TV advertiser in the world, scaled back its targeting efforts on Facebook. First, the company is reportedly on the verge of rolling out a new video advertising unit that will play in the middle of videos — kind of like a TV commercial. Second, Facebook is focusing much more on being an advertising platform with massive scale than can also target — kind of like cable TV, but better — as opposed to a measurement machine that targets individuals and tracks them to the grocery store register. That last point may not seem like much but it’s a noticeable shift: on last quarter’s earnings call COO Sheryl Sandberg focused on the fact Facebook made it possible for brand advertisers to do “big brand buys on our platform like they would do on TV, but make them much more targeted.”; exactly one year earlier the pitch was “personalized marketing at scale” and “measuring ROI”. I think this is the right shift for Facebook, but it also highlights why Snapchat is very much its rival: thanks to Facebook’s ownership of identity the latter is unlikely to mount a serious challenge for direct marketing dollars (although it is — mistakenly in my opinion — building an app-install product); however, if identity is less important for brand advertising than simply scale, then Snapchat’s push for attention, particularly amongst young people, is very much a threat to Facebook. Not that that is much comfort to TV: Facebook and Snapchat have peeled off the “escapism” job in terms of attention; doing the same in terms of advertising is a question of when, not if. Meanwhile, Netflix is proving to be far more than a “hope”; as I described last year in Netflix and the Conservation of Attractive Profits, the company leveraged the commoditization of time enabled by streaming to own end users, creating the conditions to modularize suppliers — and that’s exactly what is happening. What is interesting is that scripted TV is turning out very differently than music: instead of leveraging their back catalogs to maintain exclusivity on new releases, most networks sold the former to Netflix, giving the upstart the runway to compete and increasingly dominate the market for new shows. The motivation is obvious: networks have been far more concerned with protecting their lucrative paid-TV revenue than with propping up their streaming initiatives; the big difference in music is that the labels’ old album-based business model had already been ruined. It’s a lot easier to move into the future when there is nothing to lose. 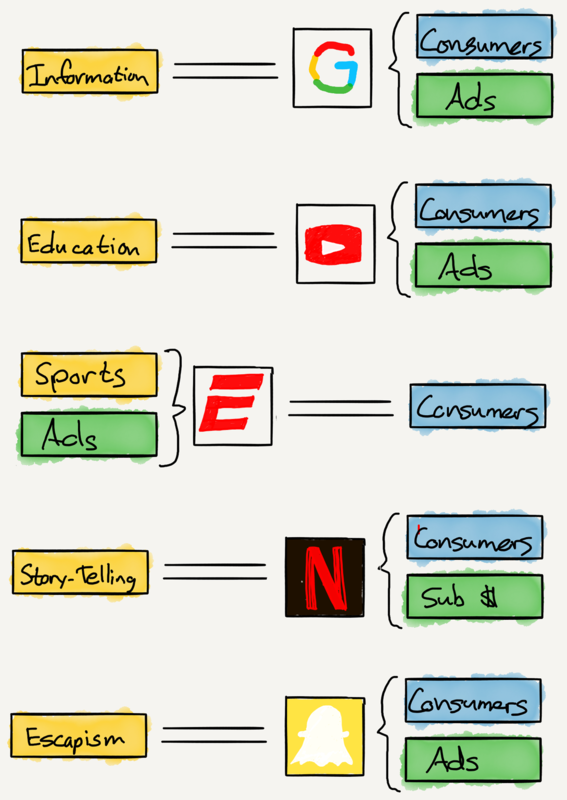 To put this concept in concrete terms, the vast majority of discussion about paid TV has centered around ESPN specifically and sports generally; the Disney money-maker traded away its traditional 90% penetration guarantee for a higher carriage fee, and has subsequently seen its subscriber base dwindle faster than that of paid-TV as a whole, leading many to question its long-term prospects. The truth, though, is that in the long run ESPN remains the most stable part of the cable bundle: it is the only TV “job” that, thanks to its investment in long-term rights deals, is not going anywhere. 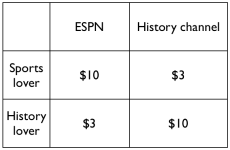 Indeed, what may ultimately happen is not that ESPN leaves the bundle to go over-the-top, but that a cable subscription becomes a de facto sports subscription, with ESPN at the center garnering massive carriage fees from a significantly reduced cable base. And, frankly, that may not be too bad of an outcome. To be sure, it will take time for a lot of this analysis to play out; indeed, I’ve long criticized cable-cutting apostles for making the same prediction for going on 20 years. It’s a lot easier to predict unbundling than to say when it will happen — or how. To that end, this is my best guess at the latter; as for when, the amount of change that has happened in just the last three years (since I wrote The Jobs TV Does) is substantial — and most of that change was simply laying the groundwork for actual shifts in behavior. Once those shifts start to happen in earnest there will be feedback loops in everything from advertising to content production to consumption that will only accelerate the changes, resulting in a transformed media landscape that will impact all parts of society. I’m starting to agree that the end is nearer than many think.